Running With Crayons, the developer behind popular OS X search replacement app, Alfred, has launched a companion app for iOS, allowing you to perform actions on your Mac using your phone. 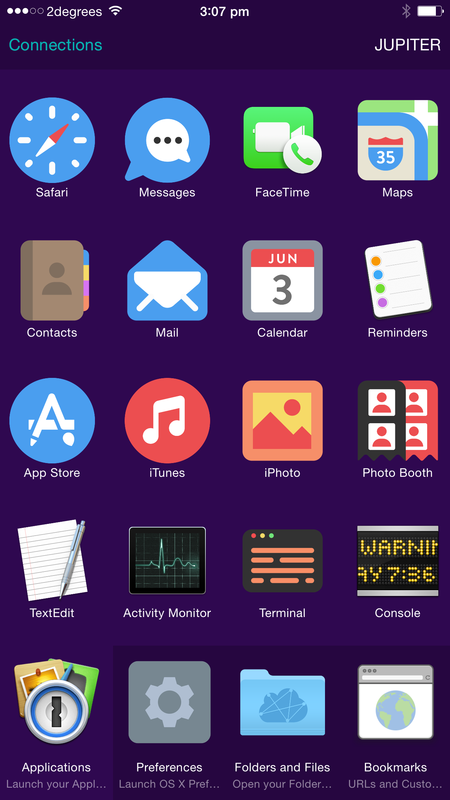 Alfred Remote shows a customizable screen of icons that can invoke apps, lock your computer, run workflows and perform custom searches from your phone. The idea is to turn your iPhone into the ultimate remote control for your Mac. The app wirelessly connects to your Mac and is for the most part a dedicated app launcher. I left my phone plugged in with the app open on my desk and found it handy for quickly opening apps rather than having to search for them. It’s super fast; things happen basically as soon as you tap the phone. The biggest use I see for Alfred Remote is for people with computers dedicated to playing music or movies around the house. You can adjust the volume, skip tracks and stop the music in iTunes right from your phone, which would be handy for a house party. You can roll your own workflows via the Mac app, like “find this album and play it” for one-touch play using Alfred as well. The best one I’ve got set up inserts ¯\_(ツ)_/¯ anywhere with the tap of my screen. I can imagine if you had an iPad lying around, running Alfred on your desk as a quick way to launch apps would be awesome. Alfred Remote is available today from the App Store for $4.99, but requires the latest version of the main app installed on your Mac.